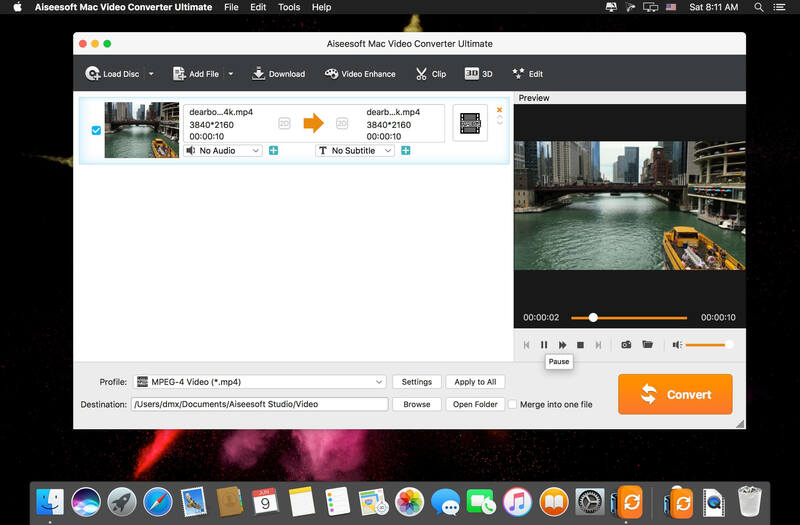 The best Mac video software ever, allowing users to easily download, convert and edit videos including 4K videos as well as homemade DVDs on Mac. Keep perfecting. 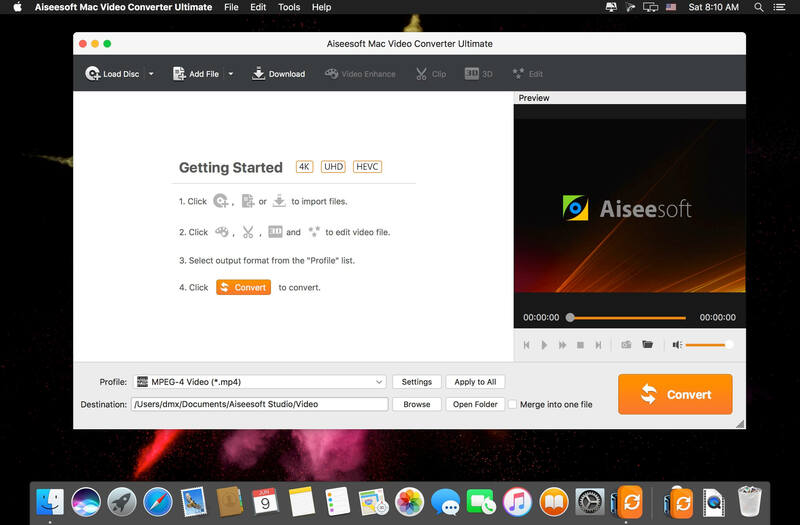 Now Aiseesoft Mac Video Converter Ultimate is greater than ever before. The new-added video enhance function makes it possible to edit your video easily. You are able to make your video clearer by upscaling video resolution from SD to HD, optimizing the brightness and contrast to make your video more enjoyable. In addition, this new-added function allows you to remove the tiresome video noise so that the video can be cleaner than the former one. Other editing functions such as Crop, Effect, and Watermark can bring out a more vivid video effect. People are more willing to record videos with phone for it is convenient for carrying wherever you go. While when you transfer the phone recorded video to computer, it may display sideways and worse upside down. The video rotate function makes it easy to adjust your video to the right angle. You can rotate the video 90 clockwise or 90 counter clockwise, and flip the video vertically or horizontally within only one click. With this Mac video software, downloading videos from YouTube, Vevo, Vimeo, Dailymotion, Metacafe, Yahoo and Facebook has never been easier. It supports all available YouTube formats (MP4, FLV, WebM) for any video quality (from 360p up to 3072p) and easily downloads all new 1080p FULL-HD videos, 2k-resolution videos, 4k-resolution videos or even 3D videos, preserving 100% of the original YouTube video's quality. Highest sound quality is available with M4A, MP3, MP4, AAC, FLV and HD formats! The best part is that you can convert the downloaded YouTube videos to as many as 432 video/audio profiles for various devices. It can convert home DVDs and videos to all popular video formats including MOV, AVI, MP4, MPG, MKV, HD MP4, HD MOV, etc. It also supports 4K converting, which means you can use it to convert all leading standard and high definition video formats to and from 4K video/audio formats. It supports every popular 4K encoding technology, including H.265/HEVC, H.264, MPEG, Xvid, VP8, VP9, etc. It supports the latest Mac OS X El Capitan. High compatibility makes it suitable for all Mac users. Adjust video brightness, contrast, saturation, hue and volume control. Remove a section that is not pertinent to the message of your video. Extract multiple segments from any video clip. Crop letterbox or pillarbox from video clips. Add text or image watermarks to personalize your video. Preview your edited video in real time, to ensure optimal results are achieved. 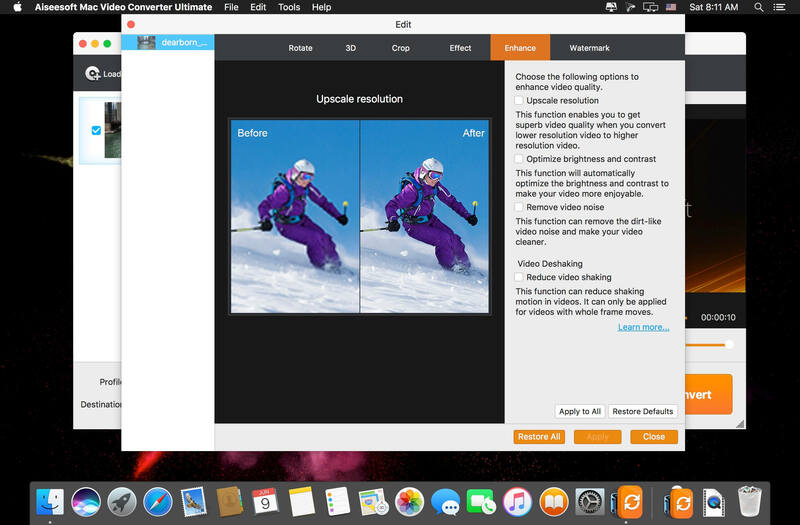 With this exceptional video software for Mac, converting home DVDs and videos to various popular personal devices has never been easier. It offers preset profiles that include the highest quality video settings for iPhone, iPad, iPod, Samsung Galaxy, Nokia Lumia, BlackBerry, Google Nexus, Moto X, Kindle Fire, etc. This Mac video software acts as a 2D to 3D conversion tool, helping users convert any standard 2D video to Anaglyph (ten types), Side by Side (Half-Width/Full), Top and Bottom (Half-Height/Full) 3D files in a variety of formats like AVI, MP4, MKV, FLV, etc. allowing playback on portable 3D video devices, computers (PC/Mac), or 3D TVs. It allows you to switch L/R image and change the 3D scene depth as desired.